Purchase in 2014 and enter the drawing to win $10 gift certificate to each store for the shop hop. Five stores are joining forces to raise awareness and funds for people in need. Donate canned goods at each store for an extra hourly door prize ticket. Hourly door prizes at each store. Individual store prizes. For every $10. spent, 1 chance to win goes in the drawing. Donate canned goods to help the hungry for an additional door prize at each store. Purchase a passport in 2014 for a chance to win a $10. gift certificate to use at each store during the hop. Pick up your FREE commemorative log cabin pin at the first stop on the hop. The 15th anniversary progressive quilt is specially designed with our signature log cabin blocks. The computer picture shows the aqua and brown colors, but check back to see the actual quilt when it is posted to appreciate the gorgeous Jinny Beyer saturated colors. A tutorial will show how simple it is to construct. Quilt is 60″ x 84″ without borders. Kits will be $10 at each store, a $40 discount off the total retail cost! Sign up now, don’t miss out. Check your local shop for bus schedules. We will be hosting another shop hop. Small holiday projects will be sold at each shop. Use for yourself or for gifts. Receive the wire hanger with the purchase of the passport. Passports will be on sale during the February Hop, while they last. More details will be posted later about the projects, sales, prizes and buses. 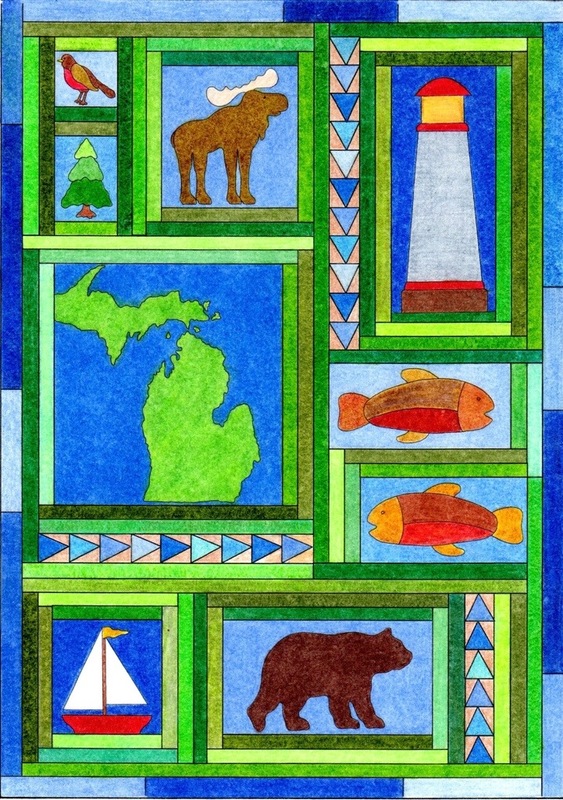 The Progressive Quilt is a small sampler highlighting the wonders of Michigan. The simple base is inspired by Michigan’s beautiful blue lakes and green forests. The kits will provide the directions for the quilt base, the fabrics and patterns for $6.00 each plus tax. The provided block patterns will include of course, the famous Michigan mitten, a sailboat, a pine tree, the state bird, 2 fish, a moose, a bear and naturally, a lighthouse. Optional patterns will also be offered for different twists on the quilt base. 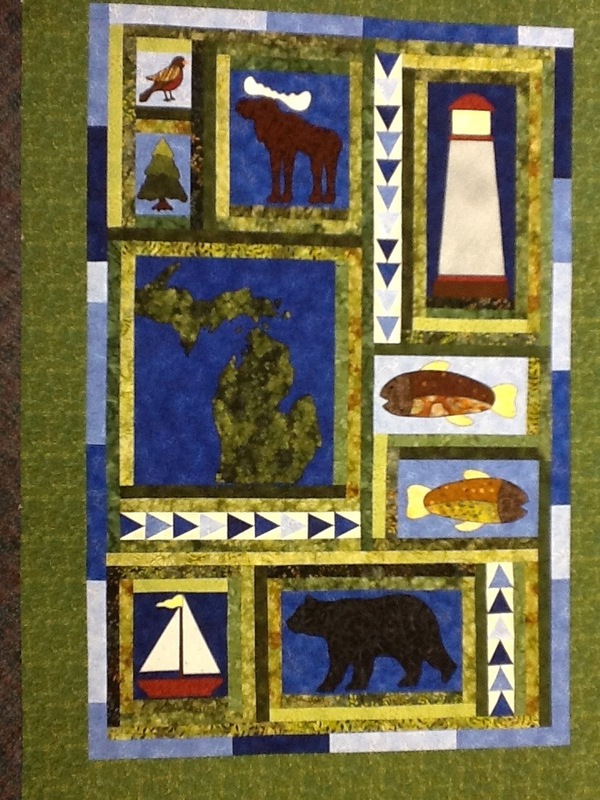 This quilt can be a great gift for the woodsman of the family, nature lovers or any Michigan college student. Add a border to increase it to lap size. Hunting for and embellishing this base quilt with vacation treasures can be a fun and memorable summer project for the kids and adults as well. We have had so many ideas for the progressive quilt this year, it was hard to narrow it down. We will be posting a computer picture soon while we are creating the quilt. This quilt will be a great collection of patterns and has an irresistible price for all the gorgeous Robert Kaufman fusions and batiks. Don’t miss out on this one. Purchasing a passport this year will add your name in a drawing to win gift certificates to all the stores and be used during the 2013 hop. The winner will be announced January 2nd. The gift certificates will be waiting at each store for your spending pleasure. Be sure to check all stores for any available buses.